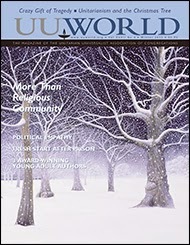 We'll discuss an article from the Winter 2013 issue, "Political Empathy." Demonizing your political opponents doesn't change anyone's mind, but empathy can. 1. Doug Muder writes, "But every time two friends find a way to communicate respectfully about their political differences, it is their own accomplishment, an undoing of the habits of conflict taught by the national voices each of them listens to and admires." What "national voices" do you listen to and admire? In what ways would have to undo "the habits of conflict taught by" the voices you admire in order to more respectfully communicate across political difference? 2. Muder says that when his own political opinions changed, it was "not because I lost arguments, but because I gained experience and grew in empathy....I didn’t change because someone beat down my defenses. The world was already changing without me, and somebody made a space for me to get on board." In what ways have your political opinions changed over the years? What caused the change? 3. Muder describes George Parker, the 50s-style stereotypical father in Pleasantville. Parker comes home one day to find that his dinner is not ready and waiting for him. "Where's my dinner?" Parker wonders. Muder writes: "If only someone could sit down with him, appreciate the discomfort of lacking dinner, and patiently explain all this" (i.e. the changing world and his options in it.) Is patient explanation what our political opponents need? Consider, for example, Mark Twain's "The War Prayer." (CLICK HERE. )The "stranger" in this tale has done "patient explaining," yet the result, as the last line of the story tells us, is that: "It was believed afterward that the man was a lunatic, because there was no sense in what he said." So what, if any, good can we expect from patient explanation? 4. Muder's final sentence refers to his friend, Jeff, whom he had known since grade school: "If I had more tools and more confidence in them, maybe Jeff and I could just talk freely and see what came up. 'Why the tea party?' I might ask, hoping (rather than dreading) that the conversation might go somewhere that surprised me." How would you assess "Why the tea party?" as a possible conversation starter? To register for this Workshop: CLICK HERE. Each of us has culture--conscious and unconscious ways of being in the world. 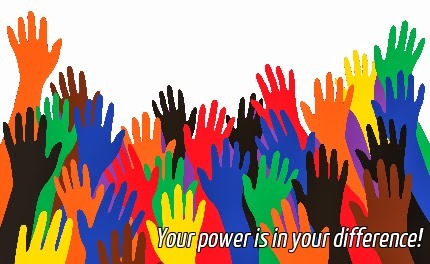 To become a truly multicultural faith, Unitarian Universalist congregations need leaders who can build relationships effectively across difference including ethnicity, class, sexual orientation, gender, and more. Come learn about a model of understanding cultural competence which will help you learn these skills. This is a similar training to that offered to ministers through the UUMA called "Who Are Our Neighbors". We live in a multicultural world -- and we aren't always the most skillful in doing our part to make this reality a good one for ourselves and for those who are different from us. This is a vital issue (a) for our ministry to help the world become more accepting and affirming, and (b) for the long-term viability of Unitarian Universalism itself. (1) Denial: Comfortable with the familiar. "I don't consider that cultural differences exist at all." (2) Defense. Us vs. Them. "I defend my home culture because I lose my bearings otherwise." (3) Minimization. Over-emphasis on commonality. "I minimize differences and focus on how I am similar with others." (4) Acceptance. Recognize cultural difference. "I am aware of diverse cultural perceptions." (5) Adaptation. Shifting perspective and behavior. "I adapt my reasoning and actions to the other's culture." For a PDF with details on these stages (and a sixth stage called "integration"): CLICK HERE. A number of UUA leaders, ministers, and consultants have now been trained in this "Developmental Model of Intercultural Sensitivity." We'll have a couple of those trained facilitators with us to lead the workshop on May 17. The workshop will also offer different tracks for people with varying degrees of familiarity with the model. What UU work in this area has found is that most UUs are at stage 3: Minimization. Our third principle must be our guide as we go forward: "Acceptance of one another and encouragement to spiritual growth." Accept who we are and where are -- while at the same time encouraging growth. Accept ourselves and each other without blame or guilt -- while also intentionally seeking possibilities for a path toward greater intercultural sensitivity. Today’s bird walk was a resounding success – success being defined that we saw more species of birds than the outside temperature this morning. White Plains reported a low of 13 degrees this morning and 18 avian species in total were seen by 5 intrepid bird watchers. Our hours for observing birds begin at sunlight at the parsonage bird feeders and end at noon, and include anywhere on CUC grounds. So even though the bird walk is 8:30 – 9:30 a.m. , late comers can still seek to observe birds before, during and after the service. Just report into LoraKim the birds you saw if not during the bird walk. For instance today I saw two black-capped chickadees outside the sanctuary windows during the service (and yes I was paying attention to the sermon, really!) 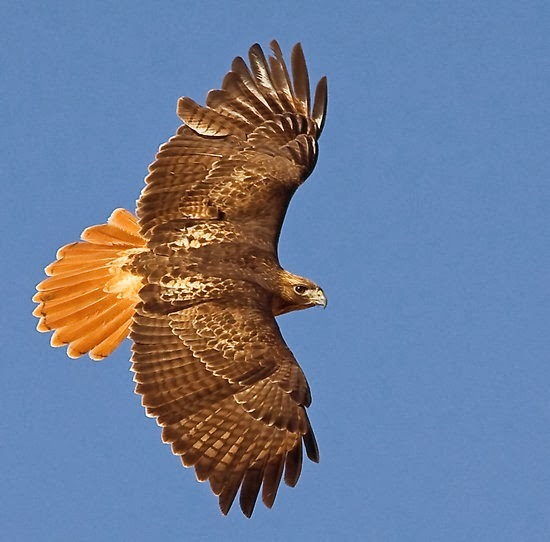 and when I stepped outside with the aroma of chili following me, I saw two red-tailed hawks flying over. They were engaging in aerial courtship displays causing my heart to quicken for indeed the promise of spring and the nesting season is coming upon us. While in the parsonage supping on Russian tea and eating cookies, we talked about the species of birds that are dimorphic, meaning that you can tell the difference between the sexes, including cardinals, juncos, downy woodpeckers, red-bellied woodpeckers, starlings, house finches, house sparrows, and goldfinches. This time of year, however, the male goldfinches resemble females in that they have not molted in their bright yellow breeding plumage. I swear, although perhaps it’s wishful thinking, that each week the male goldfinches are a little more yellow as the days march towards March. Speaking of March, the next bird walk is March 2, Sunday, at 8:30 a.m. in back of the parsonage. 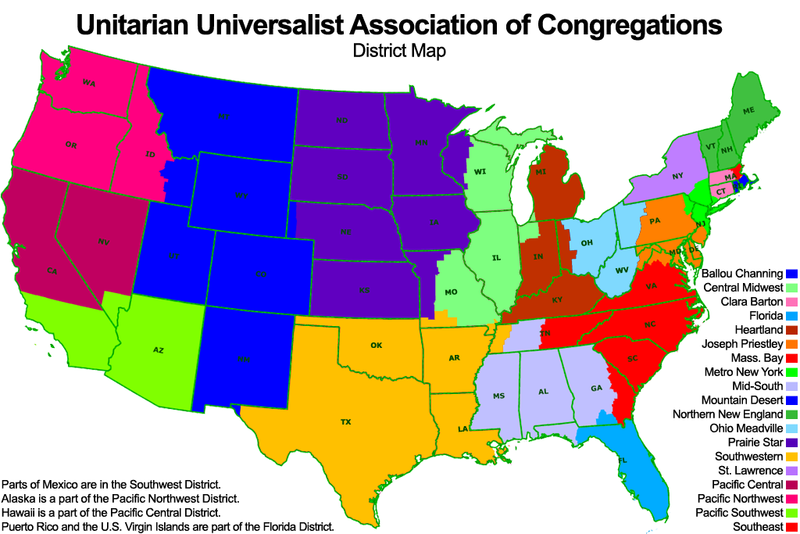 The Unitarian Universalist Association is re-organizing from "Districts" into much larger "Regions." The switch from "Districts" to "Regions" involves merging the 19 Districts into just 5 Regions. Community Unitarian Church at White Plains is in the "Metro New York District," which comprises 52 congregations in New York City, Long Island, southern New York state, the northern 2/3rds of New Jersey, and small chunks of Pennsylvania and Connecticut. 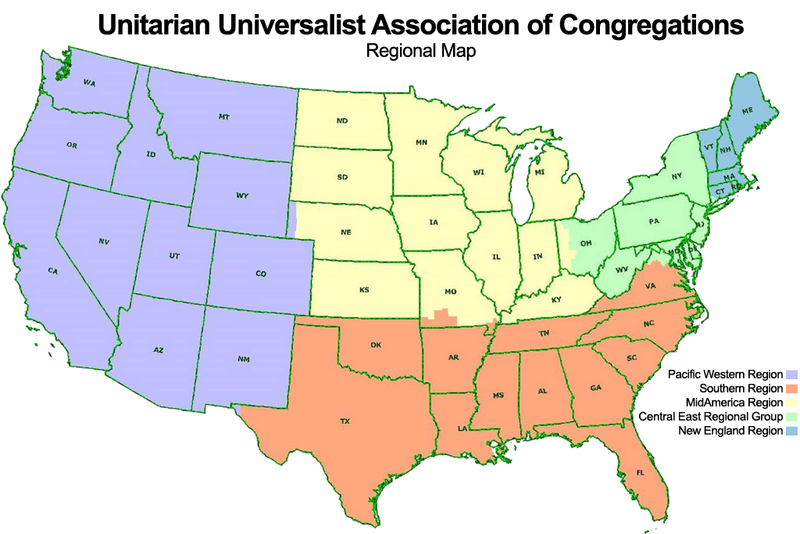 We're a part of CERG, which includes over 200 UU congregations! north to the Canada border, encompassing all of NY. The New England Region will comprise the Northern New England, Mass Bay, Ballou Channing, and Clara Barton Districts. The Southern Region will comprise the Florida, Southwest, Mid-South, and Southeast (formerly Thomas Jefferson) Districts. The Pacific Western Region will comprise the Mountain Desert, Pacific Northwest, Pacific Central, and Pacific Southwest Districts. In the next two years, our District structures will dissolve. CERG staff will consult with and offer trainings and workshops for all congregations in the Region. Annual or bi-annual "Regional Assemblies" will bring together all the CERG congregations for faith development, enrichment, camaraderie, and learning.